This card is pretty good in wild meta right now. I play recruits paladin and priest match-ups are pretty favorable for me, but i'm seeing this card around everywhere lately and it's super annoying. Another good AOE in addition to Dragonfire Potion for going up against board flood decks. It can clear 3/3 recruits generated by Tarim or Quartermaster. Dragon priests and Reno priests and combo priests are running it. Honestly why was this made rare? Its shuffle effect was pretty weird and epic-worthy. People thought this card was bad because it was 1-mana more than Hellfire for the minor benefit of shuffling it into the enemy's deck and 3 less face damage. I don't know why no one realized that Holy Nova costs 1-mana more than Consecrate for the minor benefit of healing all friendly allies by 2 and was ran by Priest at the time. Everyone, get out of here! Umm why can't i find this card in my crafting menu? I own League of Explorers but i havn't played it solo yet. Do i need to win a card once before being able to craft it?! You need to win against the bosses to earn them. Only Naxxramas-Cards can be crafted. And yes, you need to win against the bosses first. You gain it by completing the second wing of League of Explorers. Oh and no, you don't need to craft it: once you killed the boss you automatically gain the non-golden version of the card. Only Golden ones you need to craft. RIP the reno rogue I just faced. Played 2 of these cards early on, he played Reno with 2hp left and reno didn't trigger, he rage quit straight after. I think this card is underated! 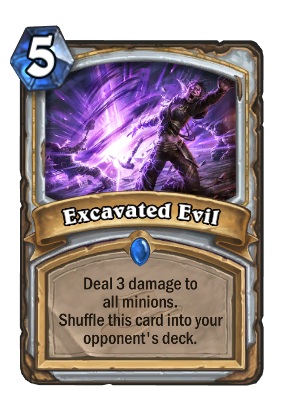 I play priest for a while, and I can say the difference between 2 (holy nova) and 3 (excavated evil) damage is enormous! Shredder, Aldors, Tunnel Trogs, Shades after 1 turn, Buffed recruits....Of course there's a downside, butI still think is worth running one of them. I use it a lot in my Shadowform Reno, where I want to keep only 1-ofs (great removal and replacement for other mass removals), and usually don't build a big board, so almost never there's a downside. My suggestion: TRY it before analyze, and I'm sure you are gonna enjoy it! Will this card undo fatigue? but it will delay a fatigue trigger. the enemy plays this and passes. I take 0 Fatigue damage the next turn as I have a card to draw, pass again and enemy passes. I then take 4 fatigue damage. A good replacement for Chillmaw in dragon priest decks, Lightbomb is probably better than this tho. What you are saying is incorrect: cards like Entomb and Excavated Evil never reset the fatigue damage doomclock. If you were at 6, it will continue at 7 once you are out of cards again. Saw Zetalot playing this card: it was far better than people here say and especially as Sigma said: It is by far not the second worst card in this wing; this card can wreck decks, especially aggro. Also it allows SICK combo-plays. Remember Holy Champion? Priest doesn't had a good way to heal damage, even with CoH when the enemy has no board. Most priest cards are above 3 health or can be easily buffed above this thereshold. So if you have a holy champion on board and enemy doesn't used a premium removal on it, then it can be devastating: excarvate evil, coh and bam. Heck, even if their board survive it gives Holy champion even more attack. Against aggro: excarvate evil and you will never see it again. Why the hell want an aggro-deck play an aoe that damages their own board, give the opponent an aoe back and also does not deal damage to his face. Giving them a dead card means you won a whole round. Secret paladin, Patron Warrior (with this card i wish that patron wasn't nerfed, because it's such a hard counter to it), all these EVIL decks out there that deserve to be punished. It's mostly an anti-aggro tool, so a perfect name for it. Also people here say why should they play this instead of holy nova: no one says that you can't play both. Great combo with COH, it's basically a 5 mana 2 card combo that requires your own minions to have 3+ hp (not a big problem with priests).